Blanch the bacon for 1 minute in boiling water. Drain. Place bacon and butter or margarine in a large covered pot or Dutch oven. Cook over medium heat until bacon is browned. Add onions; cook until golden. Add garlic, and cook for 1 or 2 minutes; take care not to burn the garlic. Remove bacon mixture from pot, and set aside. Add beef to the fat left in the pot, and brown on all sides. When meat is browned, return bacon mixture to the pot. Stir in flour, salt, and pepper. Add enough beer to just barely cover the meat. Bring to a boil, reduce heat to simmer, and cover. Cook for 1 1/2 to 2 hours. Remove pot from heat, and stir in parsley, lemon zest, and lemon juice. Serve hot. Having no idea what Belgium Beef Stew would turn out to be, everyone was pleasantly surprised in the depth of the flavor. Very easy and yet flavorful, definitely will make again. This is a tasty, rather decadent stew. Another similar recipe suggested topping it with Dijon-smeared pieces of french bread, which was yummy and might offset the "soupy" concern some have. Too much bacon for our taste. It gave the beef a strong smoky flavor. 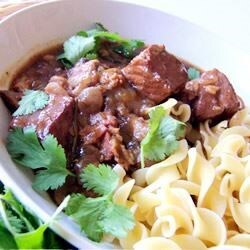 Very rich warming stew, although most British and Irish beef stews also use beer or stout in preperation.